Aaron Wright North (born March 22, 1979) was recruited as part of the live band in 2005. His playing style has caused him to receive much criticism (and praise) from both Nine Inch Nails fans and music journalists. 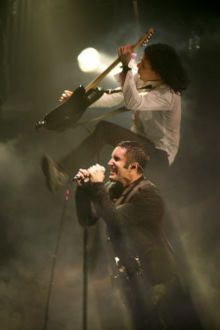 Before joining Nine Inch Nails, he was a part of the Los Angeles punk band The Icarus Line. Following his departure from NIN, North has started his own band called Jubilee. He is the main character of the web comic Squires Of Dimness. He appears in the NIN music videos for "The Hand That Feeds" and "Survivalism". He was known as Aaron Icarus while he was in The Icarus Line. 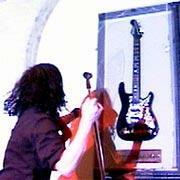 Aaron North liberating SRV guitar. In 2006, North and the rest of the band were named in a lawsuit by a venue security guard named Mark LaVoie, who claimed that North "violently and intentionally" attacked him with a mic stand. The incident happened on October 13, 2005. In 2006, the suit was finally settled out of court, for a reportedly very high sum. This page was last modified on 30 May 2013, at 03:21. This page has been accessed 113,214 times.